The Archdiocese of Detroit released a series of recommendations last night entitled Together in Faith. These reports outline a series of recommendations for the Catholic Church to continue its mission in Southeastern Michigan and to adapt to the continuing shortage of priests as well as the financial hardships that at least some churches find themselves in. The good news is that none of the three Catholic Churches in the Warrendale neighborhood will be closing in the near term. This includes Saints Peter & Paul (7685 Grandville), St. Thomas Aquinas (5780 Evergreen), and St. Christopher (7800 Woodmont). However, as the shortage of priests continues to get worse, the Archdiocese does recommend that these three churches, as well as St. Suzanne/Our Lady Gate of Heaven, at least make contingency plans for a possible merger. 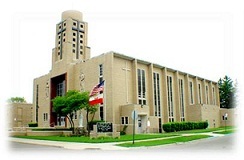 A merger of these four churches into two churches might become necessary if the shortage of priests reaches a point where the Archdiocese is unable to provide them with a pastor/administrator. Everything related to the Together in Faith proposals is available here on the Archdiocese's web site. The part that relates specifically to the churches in the Warrendale neighborhood is available here. I hasten to remind everyone that these are still only recommendations. Nothing in the Together in Faith report will become official until February 2012. I will, of course, have more on this situation as it continues to develop.